Product categories of Large Cage Trap, we are specialized manufacturers from China, Large Cage Trap, Large Animal Cage suppliers/factory, wholesale high-quality products of Boar Trap Cage R & D and manufacturing, we have the perfect after-sales service and technical support. Look forward to your cooperation! Feral hog , wild boar, coyotes, lynxes have become a problem. They will eat up the small animal s, rub your yard and farm on harvest season, cause unbelievable losses to the owner. The Large Cage Trap will be a great design to follow. The easy installment mechanical design and sensitive trigger insure absolute capture. Locking system will be secure the the safety during the trapping for both target animal and trapper. 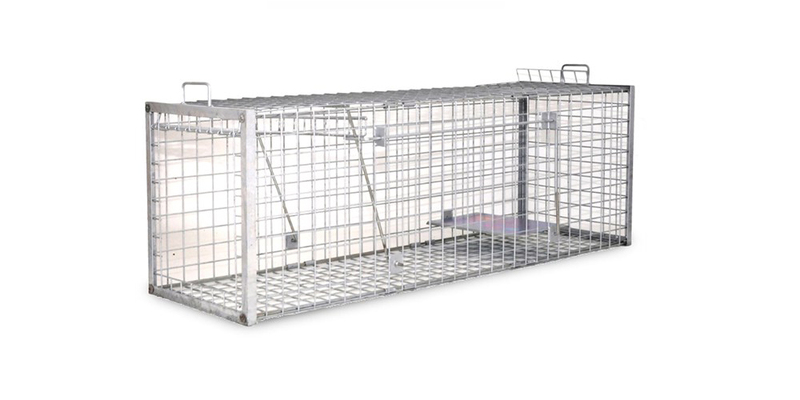 Our Cage Trap is primarily featured reasonable technical structure and heavy duty steel materials. It`s effectively capture animals like mice,rats, hedgehog...The handle of the cage trap avoiding being attacked by the animals in the trap. One-door entrance and release donate to high capture rate.